STANDISH — Bonny Eagle and Gray-New Gloucester robotics teams came out on top at the For Inspiration and Recognition of Science and Technology (FIRST) competition April 5-6. The event winner was an alliance that included Baxter Academy for Technology and Science in Portland, Bonny Eagle High School in Standish and Northwestern Regional High School in Winchester, Connecticut. BERT, which is ranked sixth in New England, also won the Innovation in Control Award, sponsored by Rockwell Automation. CUMBERLAND — Party caucuses Sunday chose Democratic and Republican candidates for a special election in state House District 45. The June 11 vote will elect a replacement for former Rep. Dale Denno, D-Cumberland, who resigned from the Cumberland-Gray seat March 27 for health reasons. Republicans on April 7 chose Kevin C. Hughes as their candidate. A Cumberland resident for more than 45 years, he owns LT’s, a Portland custom apparel decoration and branding business. Stephen W. Moriarty, a Democrat who has spent 36 years in Cumberland, was chosen by his party. The retired attorney represented House District 45 from 2012-2014, following two stints on the Cumberland Town Council (1987-1993 and 1997-2012). The Green Independent party can also caucus for a candidate; party officials could not be reached Tuesday to discuss their plans. Nominations must be submitted to the secretary of state’s office by 5 p.m. Thursday, April 18. Independent candidates have to circulate petitions and obtain signatures from at least 50 registered voters in the district and submit those by April 18. Write-in candidates must declare candidacies by 5 p.m. Thursday, April 25. CASCO — A Casco woman was recently celebrated as one of the Red Cross’s 2019 Real Heroes of Southern Maine after performing CPR on a young boy who was having respiratory issues. Last August, a young boy in the water at Outlet Beach on Sabbathday Lake in New Gloucester went into medical distress. Janelle Alpizar of Lewiston yelled for help, swam to shore to call 911 and then swam back while talking with the dispatcher. Brittany Waterhouse of Casco and Nicole Hall of Lisbon, who are both certified nursing assistants, performed CPR, and the boy was breathing when first responders arrived to take him to the hospital. The Southern Maine Chapter of the American Red Cross honored the women, as well as other individuals “who go above and beyond to make a difference in the lives of others,” at its 22nd Real Heroes Awards Breakfast on Thursday at the Italian Heritage Center in Portland. Waterhouse, Alpizar and Hall were all honored with the Good Samaritan Award. WINDHAM — The Maine Department of Transportation will hold a formal public hearing to discuss the installation of a traffic signal at the intersection of Route 202 and Falmouth Road. The hearing will take place at 6 p.m. Wednesday, April 17, in Council Chambers at Town Hall, 8 School Road. DOT representatives will hear concerns, receive comments and answer questions. FALMOUTH — A man accused of an early-morning convenience store robbery April 6 in Gray led police on a brief chase before he was found hiding in a tree. Sheriff’s Capt. Don Goulet said a man with his face covered and a hand in a pocket, as if he had a weapon, entered the Cumberland Farms convenience store on Main Street in Gray around 4:43 a.m. Saturday morning. The man demanded money from the clerk, who complied. The robber then fled south on Route 100 toward Falmouth in a dark-colored four-door coupe. Falmouth Lt. Frank Soule said officers saw a vehicle matching that description, but the driver pulled away when they tried to stop the car. A brief chase ended when the car became stuck in the lawn of a home near Leighton Road. King was taken to Cumberland County Jail in Portland. SEBAGO — Sebago Elementary School was victorious in the 8th Annual CLYNK for Schools Recycling Challenge. Sebago raised $2,142.90 and received the $1,500 first-prize award. Two hundred and fifty-six schools across Maine and New York participated in the challenge, which is sponsored by Hannaford Supermarkets, and raised over $42,000. Hannaford donated over $21,000 in matching funds. Sebago students and the Parent Teacher Committee are fundraising to rebuild an outdoor basketball court, while the student council would like to add a four-square court. Donations for the basketball court can be sent to Sebago PTC, 283 Sebago Road, Sebago, ME 04029. CASCO — Casco and Otisfield organizers are starting a Widows Resource Group with the first meeting to be held from 1:30-3 p.m. Tuesday, April 16, 2019 at the Otisfield Town Office Annex 403, Route 121. The group’s goal is to help connect widows in the area with local resources through handouts, lectures, demonstrations and workshops. Meetings will be held every third week on Tuesdays. Information gathered at the first meeting will be used to shape future programming. Participants will be able to find meeting schedules, locations and topics on the calendar at otisfieldme.gov. For more information, call Shirley Hamilton at 627-4458. STANDISH — Saint Joseph’s College recently received a $35,000 grant from the National Endowment for the Humanities. The grant will fund the proposed Education for Sustainability through the Humanities Project, which “will develop and implement educational programming that helps formulate how to build sustainable human communities and solve global problems,” according to a press release. The project will include an interdisciplinary curriculum, professional development workshops and other partnerships. Director of Interdisciplinary Studies and Associate Professor of Criminal Justice Dale Brooker will serve as the project director and lead an interdisciplinary team in implementing the project. Saint Joseph’s was one of 233 NEH grant recipients nationwide. The New Gloucester Public Works Facility is coming along, and “it’s finally looking like a building. It’s so exciting,” said Town Manager Carrie Castonguay. Work on the project began in November 2018. Castonguay said general contractor Ganneston Construction hopes to soon finish pouring the remainder of the foundation. “We’re hoping that they will be completely done (with the project) by the first or second week in November,” she said. The shared vehicle maintenance facility in Windham is nearly complete. Interim Town Manager Don Gerrish said at the April 9 Town Council meeting that “it’s beautiful. 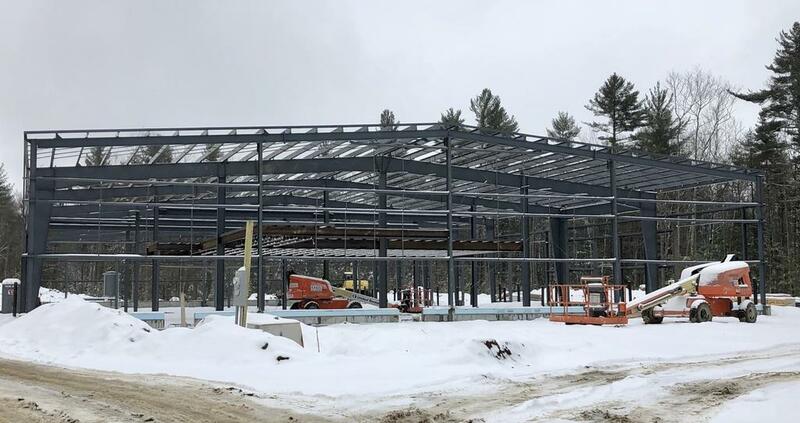 Everything is pretty much done now down there, so we’re going to schedule an open house.” Great Falls Construction of Gorham began work on the facility in May 2018. It will house Windham’s Public Works Department vehicles and the RSU 14 school bus fleet.